I've checked with the Dell parts people and they have never heard of it but that installation video is obviously from Dell. Also this is for a T7910 NOT a R7910 that stated in the URL. I do not see a liquid cooling unit on the Dell T7910 training page nor the Dell parts page. I do see, "Single Processor Liquid Cooler for T7910" on the sales page. Another user will need to open their T7910 and get the Dell 5 digit part number off of their liquid cooling unit. Did you see the link to the installation video on the Dell support page that I posted with the original message? That implies that Dell is selling this as an assessory item but I can't find it anywhere. Are you saying that the only way to get a part number is to have someone that has this to take theirs apart and the part number? If that's the case how did that person get it in the first place? 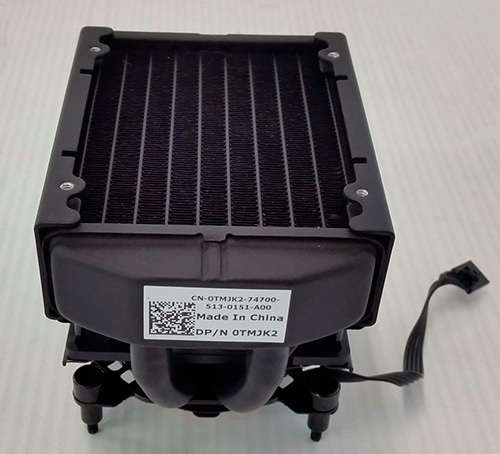 As I previously stated, "I do see, "Single Processor Liquid Cooler for T7910" on the sales page.". The fact that it does not appear on the Dell Spare Parts page means that the installation of it may be automatically tied to certain CPU configurations chosen at the point of sale. Yes, by another customer posting the 5 digit number, we could then search for it and find out if it can be purchased after the point of sale. Since other will likely also be wanting to find this at some point... Here is a picture of one, the part number is 0TMJK2. Asetek is the company that actually makes it for Dell. its an OEM part though. You cannot order or buy it directly from Asetek. Do you think the t7910 liquid cooling would work with the t7600? I checked a local dell dealer and they are able to deliver the 0TMJK2 cooler, and probably the unit would fit into the t7600 case, but I am not sure about the bios control. That is a good question. In the description of the latest BIOS for the T7910 it mentions that there was a change in the BIOS to support liquid cooling. The latest BIOS for the T7600 is over a year old and it does not mention liquid cooling at all. Also I was able to get a price quote for the cooler and it is in stock and it cost $159 so for a dual CPU 7600 is would cost over $300 for a pair of them. The BIOS thing concerns me so I don't know if I want to risk $300 on it.